So I said I would post some pictures. Annie I think you will appreciate these as a true West coaster - If things all worked out Cate and I would move there for sure. We love it there, and now I get to go out West a couple times a year with 24-7 it is feeling a lot more like familiar too. So...these pics are two of my favourite places. 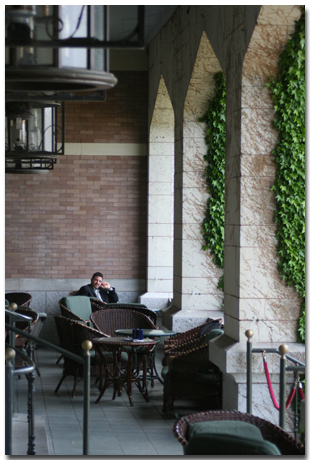 The first is the porch on the Empress hotel in Victoria. Do you ever have the experience where you see a physical place and just love it - something about the achitecture, it's function or just something...well this porch area was it for me. Old limestone, vines, comfy chairs, great view and space for all freinds and family. I can think of nothing I would like better than to have my friends and family on the porch of the Empress for an afternoon/evening party. It would be amazing. 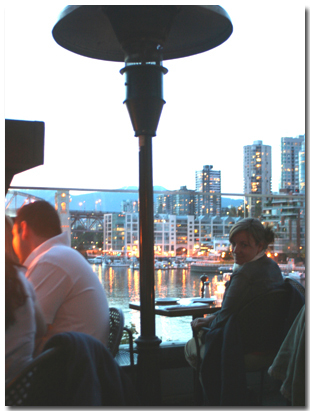 The second spot is the Sandbar on Granville Island in Vancouver. This was our last night in town and we waited for hours...and then got this seat! Worth the wait. The view was spectacular, the food was amazing and my company was out of this world. By the way - I love my wife...I love finding out more about her, her personality, her dreams. It is so exciting as a husband and friend to see someone you love so much find her voice, and excercise it. I think this is a big year for Cate. Which also means it will be a big year for us. Very excited about that.